Thanks to eagle-eyed Helen Phillips who sent us this photograph of 1927 which she discovered on a market stall in Dorset recently. 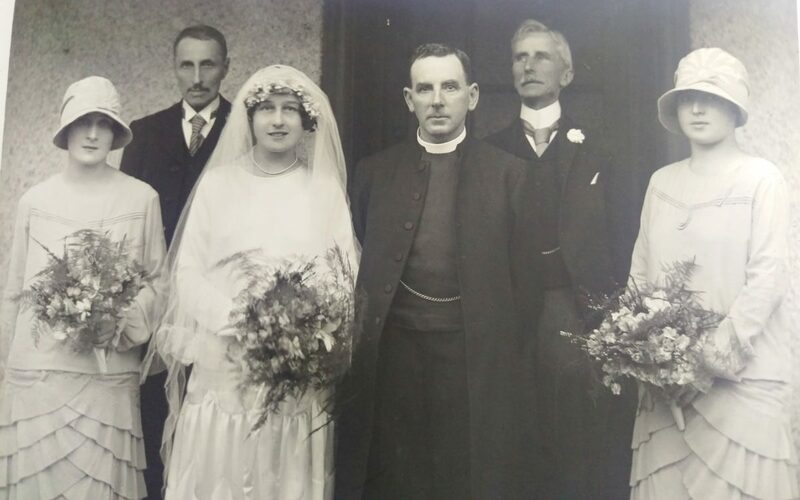 The photo shows the then rector of Rhoscrowther church, Rev’d Richard Roberts Jones, on his marriage to Mary Lewis of Llanwinio, in nearby Carmarthenshire. The photo is taken outside the rectory at Rhoscrowther – sadly now demolished (the village was cleared after an explosion at the nearby oil refinery in the 1990’s). As the medieval church remains the only marker of the community at Rhoscrowther, Helen’s find – which includes an album of photos by Rev’d Jones – is made all the more special. We’re pleased to report that Helen was able to trace the descendents of Rev’d Jones in North Wales and has returned the album to them.